You can check out my preview of the meet which you can find at this LINK. If you have anything you want to add in regards to any of the events, please feel free to add your thoughts in the comment section below. The boys 3200m. The top guys bring the names but there are a few young dogs in the hunt. The boys 1600 should bring a very fast time. with Mari Friedman the favorite. It should be a very exciting meet. So, on a distance oriented blog, the first two comments focus on the distance races? Go figure! BTW the 1600 and 3200 races will be spectacular this year. Just saying. And many of the top 1600,3200 in ccs are juniors (or younger). Going to be really tough to make state meet in those two races in ccs for the next two years. To illustrate 8:35's point, after the first round of scratches: in the 1600m there is a total of 7 Juniors, including 5 of the top 6, and a total of 4 Sophs, resulting in 11 underclassmen out of 17 runners in the first heat. In the 3200m, 17 of the 23 runners in the first heat are underclassmen, including 9 of the top 12, 3 of which are Sophs. Distance depth over the next few years is not going to be a problem for NorCal! I think anybody that is not a senior is considered an underclassman. Who is going to run under 4:09? Alex Scales, based on his past performances this year. "(high school) Upperclassmen are the 2 highest grades of high school. The Juniors, and the seniors. Juniors and Seniors are the big grades of high school. Sophomores are not yet upperclassmen but they're more respected than Freshman. Freshman look up to upperclassmen. Many Freshmen feel intimidated by upperclassmen. But its good for the Freshman to *try* to get on their good side." In the years before Google, upperclassmen meant seniors only. Anybody think the new transfer rules are going to lead to a lot of movement, especially in the first year? Also, will it lead to a bigger imbalance between public and private schools? I don't think we will see a big change with the new transfer rule. How often do we hear of athletes transferring in cross country and/or track and field? That may be different than south but we will have to see what happens in the next few years. In regards to who can run faster than 4:09, Alex Scales anchored the Bellarmine DMR team at Arcadia Invitational in 4:09.9 after running an 800 in 1:50.64. I for one am hopeful that those who need the transfer rule will be able to take advantage of it. I too often see talented student-athletes (especially across this sport) who suffer at schools and in programs without a vision for them as student-athletes. This may not be as much of an issue in the CCS (where schools are generally better funded), but many nor cal sections encompass massive wealth gaps within their member schools. How lame it must be to qualify to a big meet like Arcadia but not get to go for financial reasons. Additionally, I think this change will allow public school coaches to compete with private school ones. I'm not saying private schools recruit here, but public schools are really only permitted to mention athletics in the context of "over 600 students participate in 1 of 20 different sports here at __!". When they do anything beyond that, it is a scandal for the ages. By contrast, private school coaches are given a platform to extoll their program's success at tour/visit/shadow days (which, I can say from experience are not unlike an NCAA unofficial visit) saying things like "if your son/daughter came here they'd be joining a rich tradition which has included 7 section trophies in the last decade. Hey, maybe try a jersey on too". I know plenty of schools that would have a lot more vision if the majority of any track club incoming talent wasn't being funneled into these shadow days. Once these kids are on these trips, and financial options are made available, they're gone. (17:49 and 15:14 at Crystal), this is a special accomplishment. In recent memory, Anna Maxwell had this range of ability, but for both a female and male to have it in the same season(especially as juniors), is unusual. in the 1600 until tomorrow's CCS Top 8 competition. an exciting one to watch. Thanks again for the excellent track and cross-country coverage. The comparison between Alex Scales and Mari Friedman is a good one. They have both showed great range as you pointed out and Mari even runs on her school's 400 relay team. I look forward to seeing what both of them can do tonight in the 1600. The boys record (4:12.x) seems a bit more in reach for Scales than the girls record (4:47.x) is for Friedman. Why do the boys have a FS division and the girls don't? CCS has typically done a FS meet for both boys and girls but for the CCS Top 8 meet, it's always had only FS for boys only. If you look at the results, good freshmen/sophomore girls can compete against older girls but not so much for the boys. Also, numbers wise, there are more boys that compete in our sport. Don't forget Nikki Hiltz from Aptos. Her pr's are basically the same as Anna Maxwell's. They're both at or near the top of the CCS 1600, 3200 and Crystal Springs all time lists. Hiltz currently has the fastest D1 1500 in the country. Nikki Hiltz was quite a talent and it's great to see her still doing so well in college. I don't really recall Hiltz running a blazing 3200m but a good one! Glad she is doing well! If I recall Maxwell also ran 4:12 in the 1500m last spring also! Unfortunately heard she was coming off a Injury from late fall, but has started running again! But now getting back to the Subject Hiltz is having a amazing year and hope she keeps it up and has a great finish! Friedman has been extraordinarily great in the 800. 1600 and 3200 times are a bit short of the low 4:40's and 10's Maxwell was running, as well as Hilitz who I remember running low 4:40's and a pedestrian 10:40. Robinson was stronger in the 1600/3200 as well, as was her former teammate. Still great to see her winning all these races at who knows, as just a junior with seemingly a taste for any event, perhaps she'll surpass an amazing group of gals from the last 15 years. Justine Fedronic was and remains to be a force. Anyone know why this meet shows as official on Athletic.net but the results do not show up on the rankings lists? Possible they need to be made official. I am sure they will show up shortly if they are not on there already. The meet is up and it is official on A.net. The times show in the individual and school records but for some reason you can't see them in the CCS, State, or US rankings. Is there a button they have to press to get that to work or is it just a matter of waiting a fixed period of time? Hats off to Mari. She controlled all THREE of her races! Amazing. 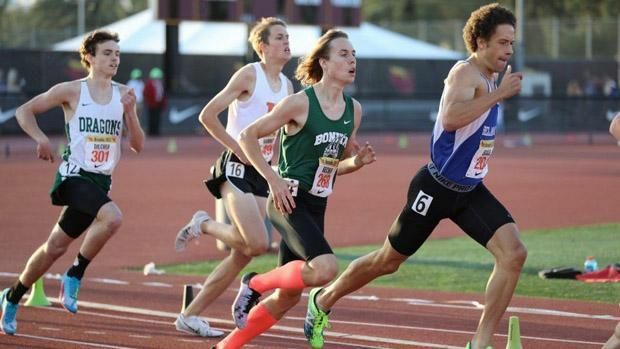 The boys 800 and 1600 races were substantially faster this year than '16 & '15. I think they have to be made "official" and then they will appear on all of the rankings. I take that back. You need to select 'All' instead of 'Official' results. If a Frosh or Soph (formerly known as an underclassman) runs in the varsity race and breaks the FS meet record, does that qualify for the record book? Had to be done in fs division.